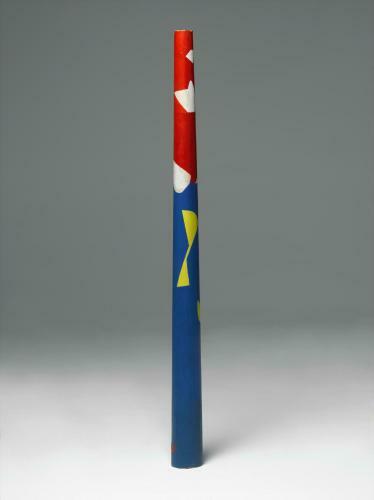 The Japanese painter Ryoichi Shigeta lived in Paris from 1958 to 1964, and then in Boston, before returning to Japan in 1966 and showing in Tokyo his first investigations in painting on curved and cylindrical surfaces. In 1969, Masaomi Unagami, director of printing-ink manufacturers Dainichi Seika, suggested that he continue his researches on the two chimneys of his factory, and Ryoichi Shigeta thus shifted his focus from the decoration of traditional Japanese pottery to industrial architecture. With his monumental motifs and the contrast of complementary colours – orange and blue – he destructured the volumes of the chimneys. Treated in this supergraphic manner, these became colour signals in Tokyo’s industrial landscape.